The Mindray Chemistry Analyzer BS200 provides fully automated analysis of up to 200 tests per hour, with 8 different wave lengths, ranging from 340 to 670 nm. This compact, benchtop chemistry analyzer is an ideal choice for a small lab, or as a secondary or back up instrument in a larger lab with features such as 24-hour reagent tray refrigeration, independent mixing for optimal homogenization, and powerful, user friendly software. 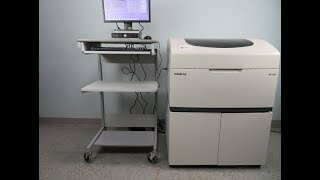 This automated mindray analyzer has 40 positions each for samples and reagents, and can use primary tubes, various sample cups, can handle STAT, and non-fixed positions of samples, control and calibrators. The BS200 also features liquid level detection, collision protections and probe cleaning so you can be sure samples are well taken care of. The Mindray BS200 Chemistry Analyzer reports to users throughout the entire process with dynamic and real time displays of statuses, including runtime statuses of the reagent bottles, sample and reaction trays, reagent residual volume, and reaction curve, as well as primary and secondary wavelengths. Users of this drug screener can also view detailed profile alerts, and run diagnostics. This chemistry analyzer runs Bichromatic testing to avoid interference, and has a broad range of curve types to choose from both linear and nonlinear. The BS200 analyzer can also use cost saving disposable sample cuvettes to avoid cross contamination or carry over. This Mindray BS200 Chemistry Analyzer / Drug Screener has been fully inspected and is performing beautifully. All of our lab equipment comes backed with our standard warranty. Should you have any questions, please don't hesitate to contact us.